“I must not look down! I must not look down!” An older American lady in shorts and polo-shirt gropes for the handrail of the ladder-like wooden staircase, looking intently at the remains of the temple cella above her. “I must not look down! I must not look down!,” she keeps repeating like a mantra while she begins her painfully slow descent from the 58 m high and very steep-sided pyramid of Temple 5. From the platform on top we finally get a much appreciated overview over the main plaza and the twin pyramids as well as the dense jungle covering most of Tikal, the most important archeological side in Guatemala. Tikal became one of the major Mayan cities of the Classic Period (250-800 AD) when it adopted a new method of warfare: instead of meeting the enemy in the traditional close, man-to-man combat, the Tikal warriors encircled their adversaries and threw spears to kill them from a distance. This proved very successful, and within a short time they became the dominant kingdom of a large area. The city once sprawled over an area of 16 square kilometers, but after it was abandoned at the end of the 10th century the tropical forest soon recovered the territory. 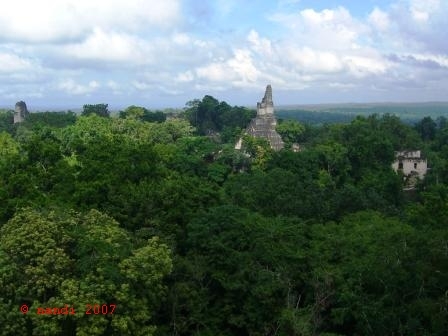 It was only in 1848 that a Guatemalan government expedition rediscovered Tikal, which became a World Heritage Site in 1979. Until today only parts of ancient Tikal have been excavated. While we walk beneath the dense canopy of ceibal and copal trees from one temple ruin to the next, we hear howler monkeys swinging through the branches. They do howl indeed, and we imagine a family of King Kongs just kidnapping a blonde beauty. When we spot some of them we notice with surprise that they are rather small and have white pot bellies. On a clearing, a group of children examines a lethargic tarantula. Not only in the jungle, but also in our accommodations we were able to observe the local fauna quite closely. In our bloc hut in the mangroves in Rio Dulce, a hunting spider the size of a hand guarded our sleep, and in Livingston groups of cockroaches, encouraged by a power cut, only slithered away when our flashlight beam hit them. The next day Isa could watch a large rat hurry along a ledge in our bathroom. “To Antigua? The buses leave in the Trebol area, but you should not go there – it is very dangerous.” The woman in the bakery hands us a sweet apricot bun through the iron bars and glances at our backpacks. “And by the way, it is very dangerous around here, too,” she adds somewhat unhelpfully. There are a number of free apartments in the guarded compound in Zona 10, one of the more affluent quarters of the city. “Come and live in our apartment complex, we have our own thief. You don’t even have to go out to get robbed!” Debby, a music teacher at the American school in Guatemala, recalls the time when things had regularly been stolen from her home. She and other tenants suspected the gardener, but nobody bothered to call the highly corrupt police. “Instead we pressured the owner to sack the gardener, which he finally did after 3 years!” she continues. We had hoped for some volcano hiking near Antigua and the Atitlan Lake, but due to increased robberies targeting tourists, most agencies have stopped their tours. Those who still offer a tour to Acatenango volcano take an armed security guard. A bit over-enthusiastic, the owner boasted that the guard had 15 shots in his gun, but the robbers had only one! We decided that we do not feel comfortable hiking under these circumstances, and went south to San Salvador a bit earlier than planned. The mountains and countryside in Guatemala do look very tempting, though, and most people are very friendly. We hope to come back at some point in the future.